The Mer de Glace is the largest glacier in France. Spread across 7 kms., the glacier is around 200 meters deep. A perfectly adventurous skiing spot, thousands of skiers follow the glacier down to the Montenvers Railway station after skiing the famous ‘Vallee Blanche’. 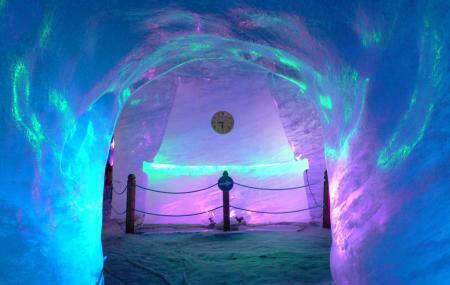 Attractions at the Mer de Glace include the Ice Cave, the Temple de la Nature and the Glaciorum. The approach to the Ice Cave has around 400 steps. Not wheelchair accessible. Note: Rates mentioned include a total package- the train ride, the cable ride and the attractions. Timings mentioned are for the little train that travels up to the glacier. First train to leave from the station is at 10 am. Intervals of 20-30 minutes. Last train to leave from the glacier for the return journey is at 4.30 pm or 5.00 pm (seasonal timings apply). How popular is Mer De Glace? People normally club together Lake Gaillands and Parc De Loisirs while planning their visit to Mer De Glace. Amazing place with awesome views. Mar de Glace is just great. And the telepherique is very easy going: not crowded at all and very easy to take it. Only 20 minutes to the Mar de Glace. 100% recommended. A short train ride takes you to a panoramic point for a great overview of the glacier and the surrounding mountains. The glacier is melting rapidly but its size is still very impressive. You don't realize how massive it is until you're seeing it with your own eyes. Taking the cable cabin and walking down the stairway gives you a good impression of how big the site really is. Once you made it down to glacier level you can visit the ice caves. You'll also see and hear rocks tumbling down the mountain walls which is quite impressive. My spouse was in Chamonix during the last third week in March (still winter) for a conference and I accompanied her. We were looking for something to do and this activity was recommended. The railway ride was nice but, at times, visibility was poor because of fog or blowing snow. As others have mentioned, the number of steps to the ice caves in the glacier (sea of ice) are almost 500. Going down to the ice caves is not bad. The return can be difficult. Plan to stop several times to catch your breath during the return trip. If going during the winter (i.e., third week in March), then dress appropriately (hats, gloves, layers) so that you can adjust your temperature accordingly. Fantastic Cogwheel train experience! Lots of great pictures on the way up! If you like hiking, rather hike up to the glacier, its easy accessible and a beautiful path, well marketed and it will take you around 2-3 hours, depending on your level of fitness. Alternatively, you can hike on the way down and take the train first. Enjoy it!